5 bdrm 5 1/2 bath. Sleeps up to 12 guests. Affordable 5 bedroom Beach Walk Villa is located on one of St John’s most spectacular tropical reefs. Sleeps up to 12 (5 bdrms, 2 sofa beds). Priced according to the number of guests, we will only rent to one group on the property at a time whether you have just two or up to 12 people. Couples or teens using the lower level have their own mini suite complete with second washer/dryer, microwave, refrigerator, living area, two bedrooms and two baths. The main upper level has three bedrooms, three and one half baths, and a fabulous Great Room surrounded by glass to let in the spectacular all around view. Open the screened large glass windows to hear the sound of the surf that you will never forget. The fun really begins outside at Beach Walk. Our calm crystal clear water offers some of the best swimming, snorkeling, kayaking, and paddle boarding on St John. We provide you with snorkels, masks, kayaks, and paddle boards free of charge. Why have to drive every day to a crowded beach? You can swim, snorkel, kayak/paddleboard, or take a brief hike over to the beach at Chocolate Hole. We prefer to snorkel because the reef is teeming with beautiful, colorful sea life that you will not want to miss. The kids love searching for shells and hermit crabs along our rocky shore. When you're not out having fun in the ocean, relax on the pool deck or hammock just steps from the reef. You can listen to the peaceful sounds of the shore while going for a refreshing dip in our 15' diameter x 52" deep pool. Perfect for a refreshing plunge or float. Options for fun are endless and just right at your front door while visiting Beach Walk. Beach walk villa is only 2 miles from Cruz Bay shopping and dining. 1 mile to Westin Resort - scuba; sail; beach bar & more. Chocolate Hole Beach a 3 minute oceanside hike from the villa. We are John and Vicky and are veterinarians in Virginia. We honeymooned on St John at Caneel in 1993 and have now returned over 100 times. We love to sail, snorkel, and listen to the sea breeze and surf just outside our panoramic windows at Beach Walk. Our daughter and dog also love Beach Walk. Especially exploring all the coral along the shore, finding hermit crabs, and spotting iguanas in the trees. One of St John's best locations due to being located adjacent to a magnificent Tropical Reef. Very convenient to groceries, shopping, restaurants, Cruz Bay, and the north shore beaches. Kayaks, Snorkel gear, and paddle boards free of charge. Beach Walk is a rare find being located on some of St John's most beautiful waters. Swim and snorkel and kayak without always having to drive somewhere. The sounds and sights are remarkable at our waterside villa. Some of the best fun on St John is our tropical reef right outside your door. Each full bath is accessed by the bedroom. Three indoor (main and master levels) and two outdoor showers (lower level), vanity, courtesy shampoos and soap provided. Fresh towels provided as well as beach towels. We love to snorkel to the beach or hike along the rocky shoreline. Kayak, swim, snorkel, and paddle board in some of St John's best waters right at your door. The beautiful white sand beach of Chocolate Hole Bay is in view while snorkeling and kayaking at Beach Walk. A favorite is kayaking over to the beach for sunning and swimming. No need to drive to the beach when some of the best snorkeling and water activities on St John is right at your villa. Hike to the beach. A short 3 minute stroll along coral/rock shore. Everyone loves the soothing sounds of the surf just a few steps from your door and just outside the wrap around Great Room windows. The water is crystal clear and so inviting. A/C throughout Beach Walk Villa! Two kitchens. Main on upper level and second kitchen on lower level. Kayaks and paddle boards provided free of charge on site. You will love kayaking and paddle boarding our crystal clear waters right outside your door. Unforgettable and just beautiful. Listen to the surf as you enjoy cocktails from ocean side chaise lounges or the pool deck bar shelf. Snorkels and masks are provided. Our pool and pool deck is just steps away from one of the most beautiful reefs on St John! Pool size is 15' diameter x 52" deep. Snorkel gear, life jackets, paddle boards, and kayaks are provided free of charge. Two places to swim - our private pool and the crystal clear waters of the Bay just steps from your door. Our reef and variety of sea world life is well known to be among the best on St John! We've stayed at a few different villas in St. John and Beach Walk might be my family's favorite due to it being on the water, plus it's a couple minute hike to the Chocolate Hole beach where the kids can play at any time. Usually we have to pack the whole family up to go to Trunk or Maho beach, which we still do, but early in the morning or later after dinner, the kids can go play at the private beach while stay back at the house. The new pool and pool deck are awesome, not to mention the kayaks. Great house, amazing location, incredible sunsets every night. First, Steve and Lisa were GREAT - they were extremely nice and helpful. Everything about the house was great - both secluded and convenient to everything. We enjoyed the two separate living quarters- our spoiled two teens got the big house and my wife and I downstairs everyone with their own bath. Nice to be on the water. Only negative is mosquitoes at times by water. Overall highly recommended! Thank you for your stay! We're glad you enjoyed the convenience of our location and the ocean just steps away. My wife and I stayed here the week of July 1, 2017. The house is very comfortable and great location on Chocolate Hole. We enjoyed everything about the property (except for the "no-see-ums" but no control over that). Lisa & Steve met us at the dock and helped us get our rental car as well as escorted us to the house and gave us an informative tour of how everything functions. It was great! Lisa had also prepared a little welcome bag with some wonderful seasonings, coffee, and maps of the island. A very nice touch making us feel very welcome. 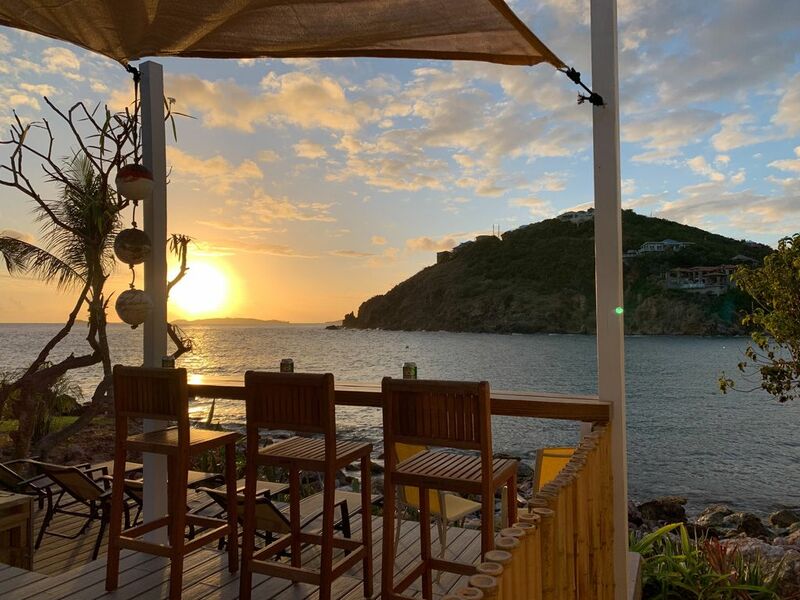 We would definitely recommend this place to others looking for a nice place to stay out of the hustle and bustle of Cruz Bay but still close enough to run into town to "hit" the local bakeries!! The house was very comfortable and cozy. The view was fantastic. We had a great stay at Beachwalk. Both the owner and the local manager were extremely accommodating and the villa was clean and well equipped. The location of the villa is extraordinary, completely surrounded by water. Unlike many villas, there was plenty to do on site-kayak, snorkel, hike and lounge. Although the place is fully air conditioned, we kept the windows open to enjoy the breeze and listened to the waves lap against the shore. The drive to the villa is probably the easiest of all villas we have stayed at on St John. In short, Beachwalk is a great villa!! we were escorted to the house in our rented Jeep. The House was clean and well stocked with items required for a beach stay. Steve and Lisa toured the house with us an explained all the important items. The driveway requires a skilled driver. The driveway patch appears to not be a legal rode. Driving on the Island can present challenges with driving on the left, hairpin turns and impatient St. John drivers. All in all we had a wonderful time despite this. There were an excessive amount of lights and it was a challenge to commit so many to memory. The cable/wifi/phone worked intermittently. Many of the doors had fingerprints. The ceiling fans were long over due for cleaning. Fun is the best way to describe Beach Walk. Sleeping up to 14 with 5 bedrooms and 2 sofa beds. Your kayaks, snorkel gear, and paddle boards are on site and you'll want to get into that water just steps away every day. Get out for a nap in the hammock and listen to the surf or take a refreshing dip in Beach Walk's pool. St. John is famous for its natural unspoiled beauty. Beach Walk displays St. John at its finest, being located 20 feet from the clear beautiful waters of Chocolate Hole. Beach Walk is conveniently located only 5 minutes from the quaint town of Cruz Bay with its great shopping and restaurants. Also nearby is St. John national park and all the famous white sand beaches including Trunk Bay, Hawks Nest, Maho, and Francis.